You will be charged with Arson if you intentionally start a fire or cause an explosion, recklessly place another person in danger as a result of a fire you started, or damage the structure of another due to a fire you started. Arson is a very serious offense and can lead to harsh penalties, including possible jail time. Depending on the circumstances, you could be charged with a first-degree felony and face 20 years in prison. There are some defenses to Arson that can be asserted and it is important to have an attorney that is experienced in this area of the law. If you have been charged with Arson, you need to hire a Criminal Defense attorney as early as possible in your case to avoid potential problems. Pittsburgh Criminal Attorney Robert Mielnicki has over 25 years of experience representing individuals charged with both State and Federal Arson offenses. You can be charged with Criminal Mischief if you damage the property of another, either intentionally, recklessly, or negligently, such as by fire, graffiti, or otherwise. You can also be charged with this crime if you tamper with a person’s property, put that person in danger, or cause that person financial loss. This is a broad crime and can encompass many different acts. The penalties range from a summary offense to a third-degree felony depending on the circumstances of the case and the amount of damage caused. It is important to hire a Criminal Defense attorney who can help you navigate possible resolutions to your case, such as ARD, probation, community service, or counseling. You can be charged with criminal trespass if you enter or gain entry into a building or structure knowing that you do not have permission or a license to be there, or if you “break into” any building or structure. To break into a structure, you must use gain entry by force, through intimidation, or by entering through an opening not designed for human access. Generally, a criminal trespass charge is a third or second-degree felony and can carry a sentence of jail time. Depending on the circumstances, you could be charged with Defiant Trespass (18 Pa.C.S.A. § 3503(b)). 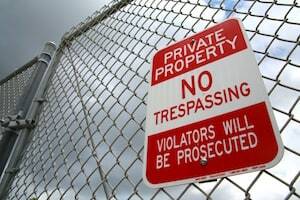 A person commits defiant trespass if, knowing you are not licensed or privilege to be on the property, enters or remains in a place after receiving notice against trespassing. Notice can be given by actual communication, a “no trespassing” sign that has been posted, or something as vague as fencing or enclosures manifesting an intent to exclude intruders. Defiant trespass can be either a third-degree misdemeanor or first-degree misdemeanor. Under the criminal trespass statute, you could also be charged with Agricultural Trespass (18 Pa.C.S.A. §3503 (b.2)). This type of trespass occurs when a person, knowing that he is not licensed or privilege to be on the land, enters any agricultural or open land that is posted against trespassers, or is otherwise fenced in a manner to exclude trespassers, such as to confine domestic animals. This offense is generally graded as third or second-degree misdemeanor and can carry a fine up to $5,000. There are numerous defenses that can be asserted to a trespass charge. Some common defenses include that the building was abandoned, the premises was open to the public at the time, or that you reasonably believed you were permitted to be on the premises. You need to hire the right Criminal Defense attorney who understands this area of the law and can assert these defenses on your behalf. Summary Offense: 90 days in jail and up to a $300 fine. Misdemeanor of the third degree: 1 year in jail and up to a $2,000 fine. Misdemeanor of the second degree: 2 years in jail and up to a $5,000 fine. Misdemeanor of the first degree: 5 years in jail and up to a $10,000 fine. Felony of the third degree: 7 years in jail and up to a $15,000 fine. Felony of the second degree: 10 years in jail and up to a $25,000 fine. Felony of the first degree: 20 years in jail and up to a $25,000 fine. Hiring the right Criminal Defense Attorney can make a difference. An attorney can fight to have your charges reduced or argue for an alternative resolution, such as probation or community service.